The humans in charge at artpaw.com are Dan & Rebecca Collins. Art Paw has been around since 1998. 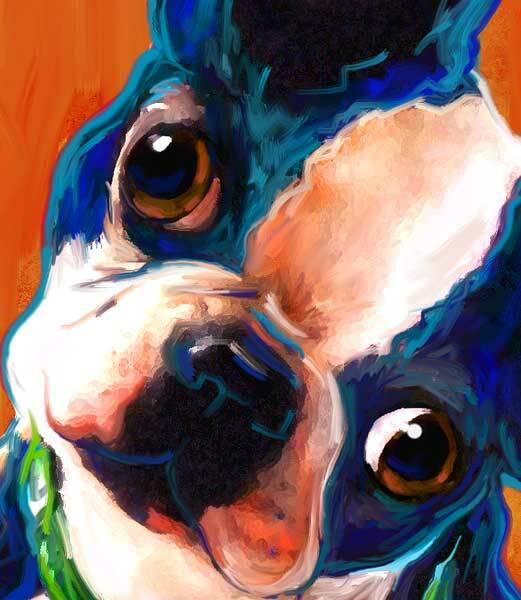 The business was the very first of its kind on the web and continues to offer the largest contemporary Art Gallery for hip and cool urban animals. Both Dan & Rebecca have a lifelong passion for Art and Animals. Art Paw allows them to join these two passions along with their ongoing affair with their Macintosh. Using the latest technology these artists can turn your ordinary pet snapshots into works of fine art. With over 25 years of training in painting, drawing and graphic design, these artists take a traditional and highly layered approach to their work. The attention to detail is high and you will often find artistic drips and splatters of "digital paint". Their painterly style is somewhat loose and occasionally messy, just like real modern oil paintings. It is this unique approach to playing with pixels that sets their work apart from other computer artists who sometimes rely on filters alone to do the work. Rebecca is a big fan of Photoshop and yet she believes that no software created can take the place of a trained eye. Rebecca uses only the very highest quality materials in her work. Located in Dallas Texas, Art Paw is a home based art studio and the Scotties sort of like it that way. Dallas clients can set up personal portrait consultations by calling 214-321-1150. The Scotties love meeting new people so give Rebecca a call. Art Paw ... creating since 1998!